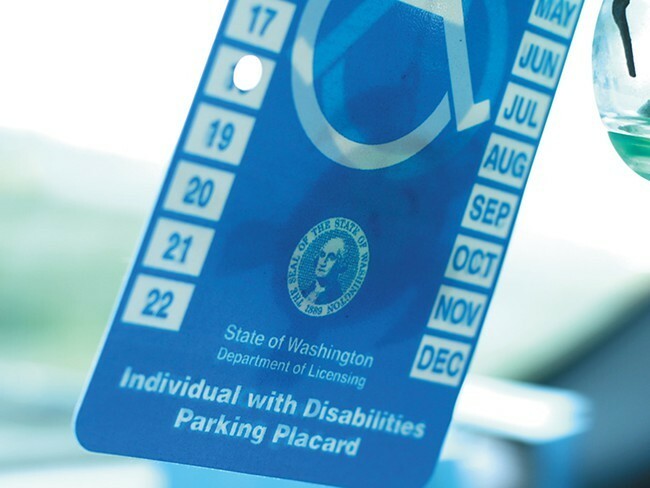 Free parking for disabled Washington drivers may end in some cities at the recommendation of a new state report, but there won’t be any immediate changes in Spokane. The group presented its report to lawmakers on Dec. 19, recommending that only drivers whose disability makes it physically difficult to feed the meter should be allowed to park for free, and that a “Payment Exempt Disabled Permit” be created to differentiate. Local jurisdictions could decide to continue free parking for all drivers with handicapped placards. 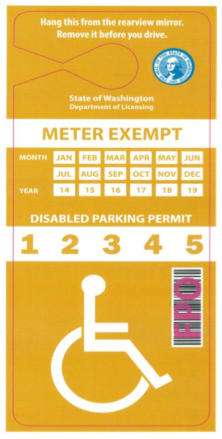 Example of "Payment Exempt Disabled Permit" that could be created for those whose disabilities make it physically difficult to plug the meter. “We’ll be watching to see what other cities are doing,” she says. • Increase and clarify penalties for fraudulent use of handicapped parking placards, and allow law enforcement to confiscate expired placards. • Redesign placards to include a barcode and larger print to make it easier for law enforcement to check for fraudulent use. • Make temporary placards good for up to a year instead of six months, since health care practitioners often sign off on permanent privileges to avoid filling out multiple applications for conditions expected to last more than six months. • Clarify language for citation dismissals. • Clarify language in the certification process to make it clear that both applicants and health care practitioners can face penalties for providing false information, and to help health care practitioners understand the difference between temporary and permanent placards. • Require the use of a prescription pad of letterhead to cut down on fraudulent applications submitted without a health practitioner’s approval.